« “The Big Chop”: Can TV News Viewers Handle It? I most agree Mr. Coleman that society has become extremely desensitized to acts of violence surrounding people of color. Gladly, I happen to not be one of them. I will never forget the day when I saw a man shoot himself in the head after a high speed chase on a Los Angeles freeway. I was only in sixth grade when I saw the footage, but to this day whenever I think about police chases that gruesome footage replays in my head. Although the news station did apologize for the graphic live content, and the man was not African- American (or at least that’s what I remember), it is still something that haunts me today. Likewise, I assume the images you saw that night will never leave your mind. Watching a television show death is extremely different than seeing the end of a man’s life that you know has family, friends, and future ambitions. The fact that this man was young and black is icing on the cake. There is something deep in my soul that is saddened by the media’s portrayal of black men- you know, the gangster rappers, thugs, deadbeat dads, and jobless womanizers. 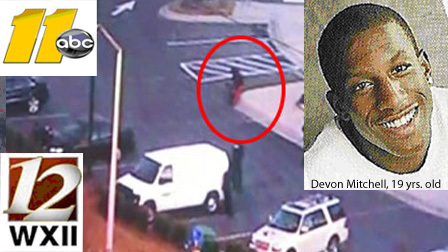 By showing this footage in the news, they are telling society that this black man’s life was worthless. It was so worthless that they did not take a second to review the footage nor stop the tape as it aired. He was not even worth the edit. I do not think this was done by mistake. Thank you for reading and commenting on this post. You are correct. That is an image I will not be able to get out of my head. Please continue to review and critique my work, because I can always get better. I’m reading Isabel Wilkerson’s “The Warmth of Other Suns” in which she describes lynchings in more detail than I’ve ever read. And not just the lynchings, but the spectacle of them–the planning and announcement of them, the clamor to attend them, the importance of making sure (white) children were there to witness them. For some reason, it was IMPORTANT to see a black man die violently. “He’s a criminal, hunt him down, shoot him, make him an example for others.” Perhaps that instinct still survives in some folks’ DNA. Thank you so much for posting this view point. That is a scenario that I didn’t think anything about. I just hope that this spectacle is an abberation, and not a glimpse into television journalism’s future.